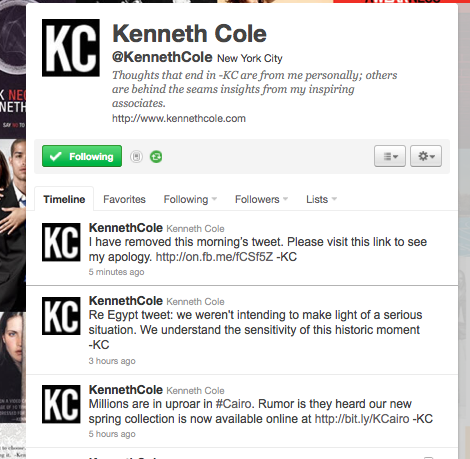 Kenneth Cole could really use my social media guru skills! 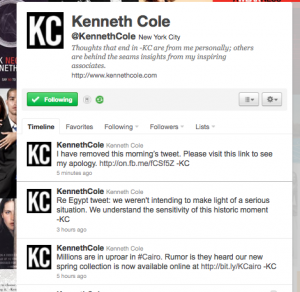 What does last week’s disastrous tweet from Kenneth Cole portend for the future of social media use by companies and executives? Will they ever learn the mistakes of their colleagues? I have one MAJOR pet peeve. Who am I kidding? I have a lot of pet peeves. Ok, well one of the things that I’d like to vent about today is the High Importance E-mail Indicator ! ! ! I’m not sure if I’m the only one, but I feel that people don’t understand “Sarcastic” language. I have been in numerous situations where I have had people really think that I was serious about what I said. Honestly, do you really think that I, or anyone, is that dumb? It’s even gotten to the point where during one of my reviews I was told I have “holes” in my head. Really? Lighten up people.